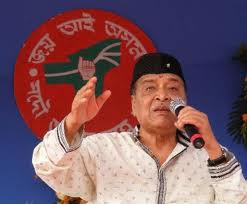 Our beloved Bhupenda @ Dr. Bhupen Hazarika has left us on 5th November 2011 due to his death we are trying to A Tribute to him by his own song.Dr Bhupen Hazrika was not only a singer,music composer, Director,social reformer but also a high class politician with morality. A multifaceted genius, he is a good poet, music composer, singer, actor, journalist, author and film-maker of the very highest repute. He is the only living pioneer of Assam.s film industry in the Northeast, and has been therefore, rightly hailed as the uncrowned king of North-Eastern India.s cultural world.